I grew up eating (and loving) raw seafood, and was fed animals/parts most people wouldn't even know of or think of as food (delicacies, my parents and grandparents called them - they're good for you). But I'd never eaten food while it was still alive - until this weekend. After seeing a YouTube video of live sea urchin (uni) complete with moving spines, which the poster let me know was from Quality Seafood in Redondo Beach - I'd decided I needed to go try it at some point. Even if the visual was a little disturbing a la Hannibal Lecter meets Detective Krendler at the dinner table (sorry, not very appetizing - but at least uni is just shellfish gonads...). Sea urchin is already one of my favorites at sushi restaurants - and curiosity as to how it would taste coming from the freshest source - live, straight from the ocean - made me overcome any hesitation. So I was super excited when fellow blogger Nomlog said she would be interested in making the trek for the experience as well! 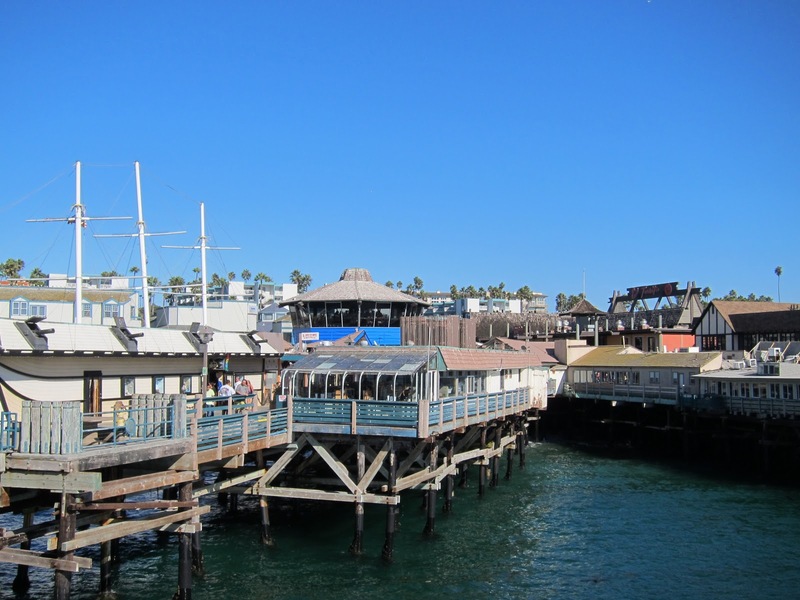 Our adventure began with a quest for a seemingly 'secret' passageway to the boardwalk - Mapquest / GPS directions asked us to turn from Catalina Ave onto Village Dr - which did not seem to exist (at least there were no signs to indicate where it was). A sea urchin in hand is better than two in the sea? Knowing the ocean was to our right, we took a chance and tried cutting through a condo complex. Following winding paths, we finally emerged at a small park above the marina - beyond which was Quality Seafood! 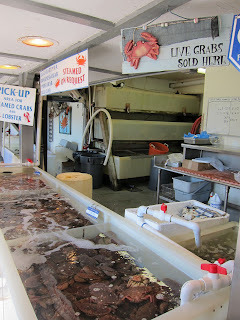 Where you can pick out your own, live, seafood from the many tanks - pay by the pound - and have them prepared/cooked to order for free. My friend "Designer", also a seafood fan, decided to join us - and we flitted around the marketplace like a trio of starving seagulls ready to dive for choice marine life. Past tanks of crab and shellfish, we found what we came for: Live Sea Urchin!!!! 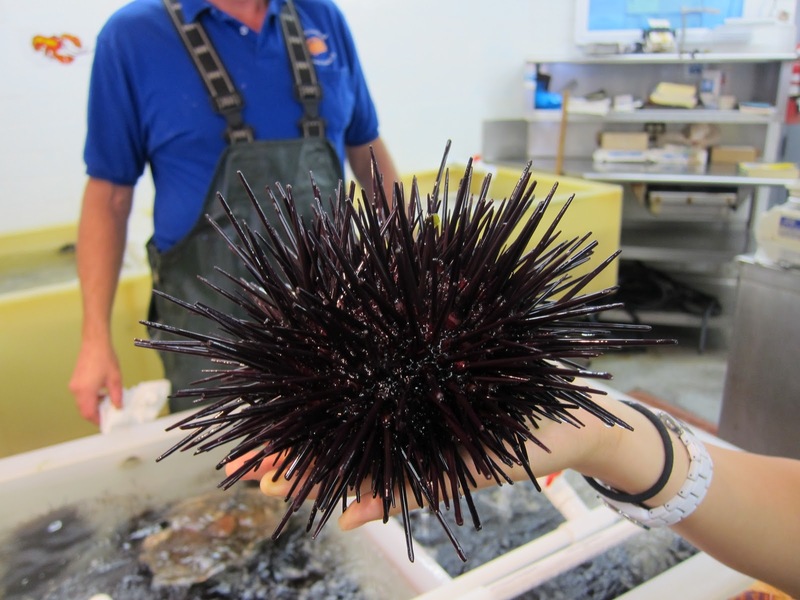 Live from the ocean - it's delicious sea urchin! We chatted with the guy behind the tanks (who is from Boston, so he knows his shellfish!) and he let us hold a live one. As expected, it was a little like trying to hold a porcupine without the soft underbelly. 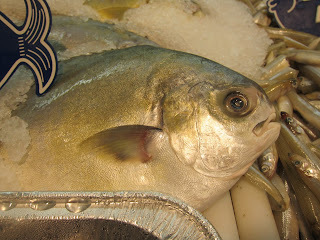 We couldn't wait to eat it (cost by the pound, the one pictured was about $11). Prepping live sea urchin involved bashing the bottom with a flat metal tool til he could lift a circular piece like a lid, draining liquids out the center - then literally poking any debris out with his finger. And voila! We have our live uni, ready to eat, spines still moving reflexively on the plate. It was a novelty vs. being creepy - we had a great time capturing lots of shots and a few videos. 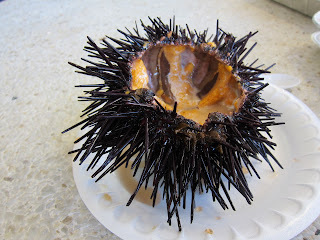 The sea urchin was of course incredibly fresh - plump with defined texture - and I loved being able to really taste the ocean with each bite. The only unexpected thing was that the innards were surrounded by a bit of a milky substance, which we didn't even really want to think about what that could be. 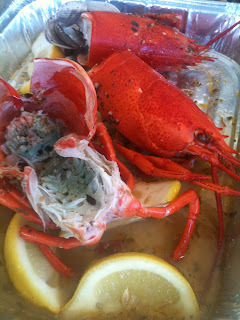 At another part of the market, Nomlog ingeniously scored a bag of Lobster heads (4 for $2.30 - an awesome deal!). Most people would pass this up as there isn't really any meat - but we knew all kinds of deliciousness was hiding inside (tomalley, the liver of a lobster that doesn't look appetizing but is rich with flavor - that Asians especially view as a delicacy)! Nomlog asked for it to be steamed, and within 20-30 minutes, we had a tray of heads to dig into for 'blue' gold! Shellfish + white wine sauce: Can anyone think of a better combination? To round out our epic feast - a tray of clams live steamed in white wine sauce. As Nomlog isn't a fan of clams, Designer and I had the giant tray to ourselves. 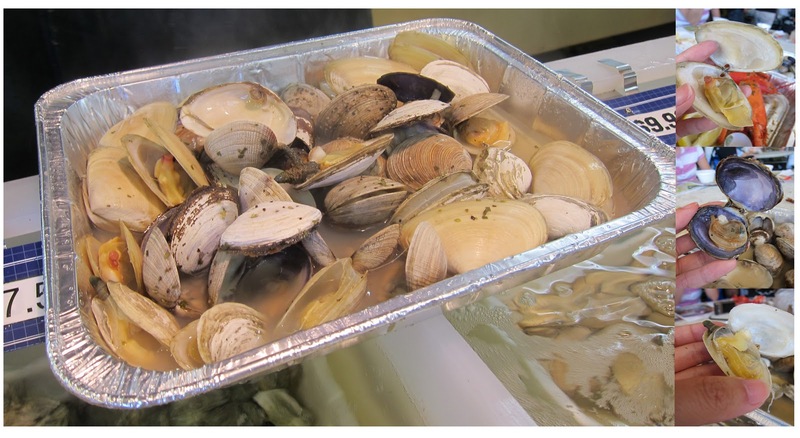 The cool thing about Quality Seafood is that you can try out the many varieties of shellfish by pretty much getting as much or little as you want - they will throw into a tray and steam it for you on the spot. Just pay by the pound. So at our friend from Boston's recommendation, we tried a handful each of Tua Tua Clams ($9.99/lb) from New Zealand, with sleek whitish shells, which according to Quality Seafood is only available through them, and Savory Clams ($8.65/lb) with purplish / black/white shell patterns, Softshell Clams ($14.29/lb) from Boston, and Manila Clams which unfortunately didn't cook right, and we couldn't eat as the shells did not open. All the clams we tasted were delicious, especially in the light white wine broth - but the Tua Tua was our favorite, sweet and succulent without any tough bits, and relatively large in size. Designer hit up the Live Crab station ($5.99/lb), for fresh steamed crab. Though it was a bit of a pain for her to have to drop a $3 deposit for a mallet for cracking the shell (then have to wait in line after to get the deposit back), and $1 per cup of drawn butter - I could tell Designer enjoyed her crab by the fact that every time I turned to her, all I could hear were sounds alternating between frenzied mallet pounding and ravenous gorging. This echoed the sounds emanating from Nomlog's and my side of the table, where we were elbow-deep in lobster, uni and bass - tomalley smeared faces (plus crab fat that Designer kindly pushed over to me) only emerging from the plates occasionally when coming up for air. Very attractive, yes I know. But that's the beauty of it - it's not a fine dining restaurant, everyone sits at communal tables outside and expects to get down and dirty with their seafood. And we were having our 'fun, fearless females' day - so the heck with what other people think, as long as we are enjoying ourselves. Beyond the tasty crustaceans, there were also all sorts of fresh fish on ice, that you could choose to either have broiled or fried. 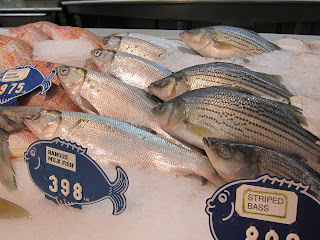 Some of which I've never heard of, like "Bangus Milk Fish", "Golden Pomfre" and "Thresher Shark". Nomlog got a lovely cut of sea bass, broiled - you can read about it (and her take on the day) here. This guy was not happy with us. Did we feel any guilt for feasting on innocent creatures? Maybe - but it's an honest, heads to tails approach - for those who eat meat, is the 'guilt' in fact any less, just because they have been processed beyond all recognition, making it easier to forget what they were before they were just food on your plate? For those looking for other items to round out their meal, Quality Seafood also offered sandwiches, corn on the cob, paella and more. We had skipped these to save stomach space for the fresher preparations of seafood. After lunch, we had a fun time exploring the rest of the boardwalk, and the beach beyond. 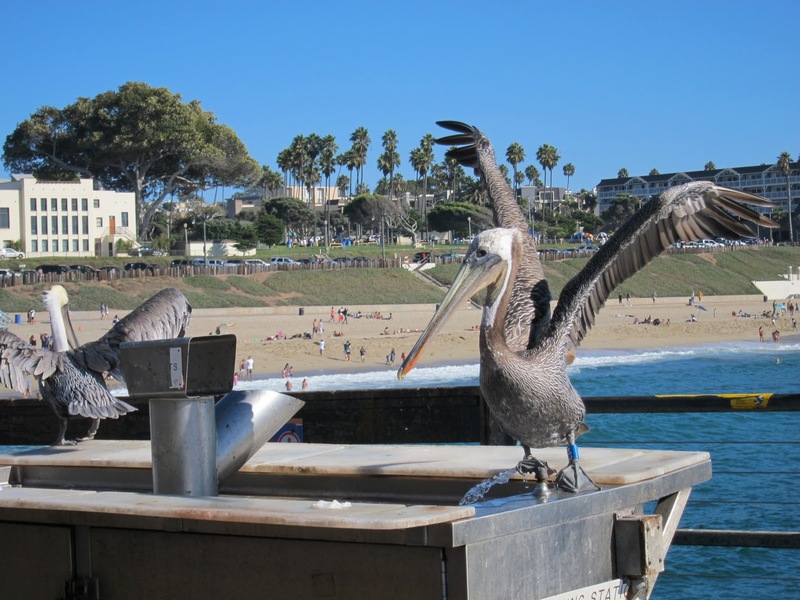 At a 'fish cleaning station', right by where recreational fishermen cast their rods, we 'met' two beautiful pelicans who were happy to take any scraps the fishermen were willing to offer. They seemed familiar with tourists and even seemed to pose for a few photos. True to the 'international' part of their name, the boardwalk offered a bunch of eateries of different cuisines that I'd love to go back and try, one of which is Pacific Fish, a Korean-owned casual spot that serves abalone and other seafood plates, along with Korean beers and soju. Another is Gambrinus, a Russian bar/restaurant with marina views (just past the water cycles) offering blini, vareniki and belashi (meat pie). While strolling the boardwalk we also noticed imprints of sea lions, otters, whales, fish in the cement. 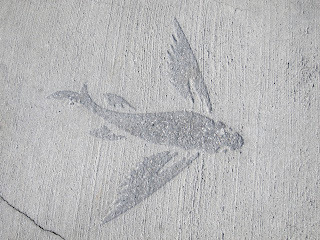 This one, a fish with wings, stood out to me - is it supposed to be a tribute to all the creatures who have gone on to a better place? Or a play on 'angel fish'? A friend's mom used to steam live crab at home, and she would always, adorably, apologize to the crabs and thank them for the food they provide before sticking them in the pot. Taking her cue, I did give silent thanks to the creatures that gave their lives to feed our bodies and souls that day. 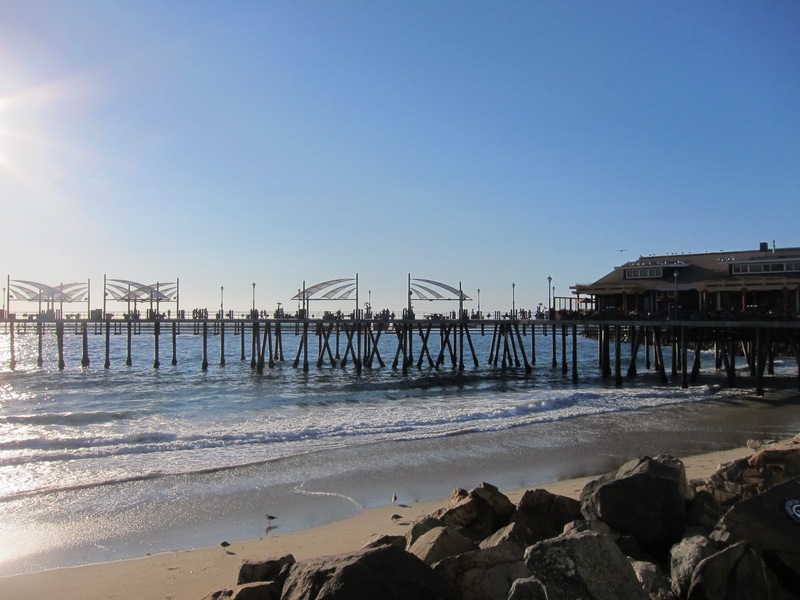 With the sometimes isolating, "A-B" destination driven car culture in LA, I really love places where you can not just go to grab a meal, but can make a day of. Redondo International Boardwalk really was great for that - after our seafood feast, had a great time strolling the boardwalk checking out other restaurants and bars, and enjoying the sun and sand (such a beautiful day, 86 degrees in *October* - this is why I love SoCal). Many others seemed had the same idea. Those inclined to further activity - there are also water cycles you can rent by the marina, and a 'nostalgic' arcade for families. Our last stop of the day was for a Churro (1 for $2, 3 for $5) - made fresh daily at at least 2 storefronts on the boardwalk. 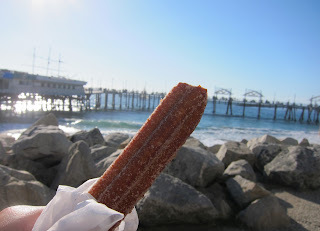 The simple stick of warm, fried, cinnamony, sugary dough - enjoyed over gorgeous views of the open Pacific - was a great way to close out the day. 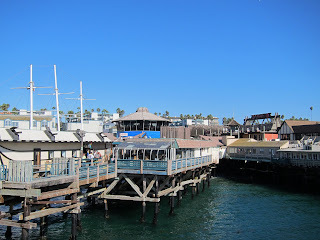 All in all, a fabulous time with fab friends - hope to see you again very soon, Redondo!